1) (Dencombe, co. Sussex). Quarterly, 1st and 4th, ar. on a bend gu. three bucks’ heads cabossed of the field; 2nd and 3rd, gu. on waves of the sea, a ship of three masts ppr. in chief three mullets ar. Crest—A sea-horse sejant, resting the dexter paw on an anchor all ppr. Motlo—Deus dabit vela. 2) (Slaugham Park, co Sussex). Gu. on waves of the sea, a ship of three masts ppr. in chief three mullets ar. Motto—Deus dabit vela. 3) (Claverham House, co. Somerset). Barry nebulee of eight ar. and gu. on a bend sa. three escallops ppr. Crest—A cubit arm embowed in armour ppr. pommelled and hilted or. Motto—Pro fide strictus. 4) (originally of Shepton Mallet, co. Somerset; James Norman, Esq., Captain R.N., who left three daus. and coheiresses: 1) Eliza; 2) Ann, m. first to James Bremer, Esq., lieut. R.N., by whom she had a son, Sir James John Gordon Bremer, Captain R.N., K.C.B., and K.C.H., of the Priory, co. Devon, and secondly to Colonel Roby; 3) Harriet, who m. Thomas Elphinstone, Esq., Captain R.N., son of Rear-Admiral Elphinstone, and d. s. p.). Barry of six or and gu. on a chief ar. three fleurs-de-lis sa. Crest—A demi lion ramp. holding betw. the paws a fleur-de-lis, as in the arms. 5) (England). Sa. a lion ramp. or. Crest—A spear issuing in pale, thrust through a savage’s head couped ppr. 6) (co. Kent). Ar. on a chev. sa. three boars’ beads couped or. 7) (Lord Mayor of London, 1250). Ar. on a chief sa. three leopards’ faces or. 8) (Lord Mayor of London, 1453). Or, three bars gu. on a chief ar. as many fleurs-de-lis sa. 9) (Honyngham, co. Norfolk). Ar. a chev. betw. three birds sa. 10) (co. Somerset). Ar. a chev. betw. three leopards’ faces sa. 11) Barry of eight ar. and gu. in chief three fleurs-de-lis sa. 12) Or, three bars gu. on a chief of the last three fleurs-de-lis of the field. 13) Bendy of six or and gu. a chief per chief sa. and erm. in chief three fleurs- de-lis ar. 14) Ar. on a fesse double cotised gu. three fleurs-de-lis of the first. 15) Ar. on a chev. sa. three leopards’ faces or. 16) Barry of six or and gu. on a chief ar. three fleurs-de-lis sa. 17) Ar. on a bend gu. three bucks’ heads cabossed of the field (another, heads or). 18) Per chev. gu. and az. three escallops erm. 19) (co. Stafford). Ar. three horses’ heads erased sa. 20) (Lee-Norman, Corballis, co. Louth; exemplified to Thomas Lee, Esq., on his assuming, by royal licence, the additional surname and arms of Norman, 1817, in compliance with the will of his maternal grandfather, Rev. Thomas Norman, of Lagore, co. Meath). Quarterly, 1st and 4th, or, a chev. betw. three lions’ faces gu., for Norman; 2nd and 3rd, ar. a chev. gu. betw. three leopards’ faces ppr., for Lee. Crests—1st, Norman: A lion pass. guard. ppr. ; 2nd, Lee: A demi lion ramp. grasping a sceptre all ppr. 21) (Lee-Norman; exemplified to Luke Alexander Norman, Esq., of 26, Rutland Square, Dublin, son of Alex Ander Norman, Esq., Q.C., on his assuming, by royal licence, 1876, the additional surname and arms of Lee). Same Arms and Crests as preceding. Motto—Honor virtutis praemium. The Norman last name has two origin theories. First, it may be a locational surname meaning “the Norman”, i.e. 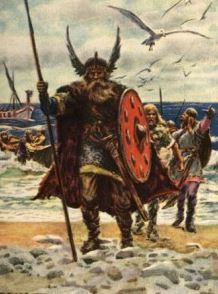 the north man, deriving from the both the Old French and Danish Normand, a name given to a person who either came from Normandy (in France) or Norway (in Scandinavia). Second, is can be a baptismal name meaning “the son of Norman”, deriving from the ancient personal (first) male name Norman, a Germanic given name composed of the elements nord (north) and man (man). The Scandinavian word is noromenn. The name was first found in county Suffolk, where records from the Abbey of Bury St. Edmunds show a bearer named Noroman who lived in the 1060s AD. George Fraser Black’s 1946 book The Surnames of Scotland has the following entry of the name Norman: “From CE. Norðmann, ‘a Northman, Dane.’ Normannus, uicecomes, witnessed David’s great charter to Holyrood, c. 1128. Nonnannus, constapularius de Enneroury (Invsrurie), was charter witness, c. 1180. William, son of Norman, burgess of Aberdeen, was one of the witnesses to a charter by Fergus, earl of Buchan. Norman filius Bertouf oi Bertulfi appears c. 120014, as charter witness. John Normand, juror on inquisition in Roxbergh, 1303, is probably John Normand, bailie of Berwick, 1324. There was ‘trublance’ betwixt Robert Normand and another in Dysart, 1600. Norman was also a surname in Dumfriesshire in thirteenth centery. It is also used as an Englishing of Tormod, which see”. Common spelling variants or names with similar etymologies include Normand, Nomandy, and Normanville. The last name Norman ranks 461st in popularity in terms in the United Status as of the 2000 Census. The name ranks particularly high in the following four states: North Carolina, Tennessee, Minnesota, and Arkansas. The surname Norman frequency/commonness ranks as follows in the British Isles: England (301st), Scotland (753rd), Wales (207th), Ireland (1,771st) and Northern Ireland (2,305th). In England, it ranks highest in Cambridgeshire, Bedfordshire, Hungtingdonshire, and Somerset. In Scotland, it ranks highest in Kinross-shire. In Wales, it ranks highest in Brecknockshire. In Ireland, it ranks highest in Waterford. The name is also present throughout the remainder English speaking world: Canada (718th), New Zealand (461st), Australia (364th), and South Africa (826th). The 1890 book Homes of Family Names by H.B. Guppy, states the following in regard to this surname: “This name has a disconnected distribution in different parts of England. It has evidently three or four independent homes, the two principal being in Cambridgeshire in the east and in Somerset in the west. It is remarkable that in the 13th. century this surname was very numerous in Cambridgeshire, just as it is now; then, also, it was similarly established in the neighbouring county of Norfolk, and in the not far distant one of Bucks (Hundred Rolls)”. The Hundred Rolls of 1273 AD, a census of Wales and England, known in Latin as Rotuli Hundredorum lists ight bearers of this surname: William Northman in county Sussex, Robert Northman in county Oxfordshire, Alex le Normaunt in county Lincolnshire, Mathew le Norman in county Oxfordshire, Lucas Normannus in county Devon, Ailicia filius (son of) Normanni in county Cambridgeshire, Robert filius Normanni in county Nottinghamshire, and Philip Norman in county Cambridgeshire. A one Robertus Normand was listed in the Furness Coucher Book as living during the 21st year of the reign of King Richard II of England (1377-1399). Early baptisms involving this surname include Geoffraie Normand, son of Anthonie Normand, at St. Mary Aldermary in London in 1583 and Anne Norman, daughter of Anthonie at the same church two years later in 1585. The famous genealogist Bernard Burke’s book “The Landed Gentry” discusses five branches of this family: 1) Norman of Dencombe and 2) Norman of Glengollan. John Manship Norman, Esquire of Dencombe in county Sussex was born in 1799 and he was Barrister at Law, Justice of the Peace, Deputy Lieutenant, and Chairman of the Cuckfield Union. In 1830, he married Catherine Eliza, daughter of Reverend George Maximilian Bethune of Rowfants. Burke traces the Norman genealogy back to a family that was settled for several generations in Cumberland. John Norman, Esq. of Carlisle, son of Robert, married a member of the Johnson family and had three issue with her: Robert, John, and James Ormond (of Bloomsbury Square, married May Bethune and had issue with her). The eldest son, Robert Norman, Esquire, left Cumberland and settled in London and procured property in county Kent. In 1797, he married Elizabeth, daughter of Simon Goodman Ewart, Esq. only son of John Ewart Esq. of Bush Court and had issue with her: John Manship, Robert Ewart (1865), Henry (of Bird Oswald, late Lieutenant 10th Royal Hussars, married Caroline Balarde), and Elizabeth (married George Hedley, Captain 2nd Dragoon Guards). The Norman Coat of Arms (erroneously called the Norman Family Crest) was blazoned as follows: Quarterly: 1st and 4th, argent, on a bend gules three bucks heads cabossed of the field; 2nd and 3rd; gules, on waves of the sea a ship of three masts proper in chief three mullets argent and proper. Thomas Norman, Esquire of Glengollan, county Donegal was Justice of the Peace, Deputy Lieutenant, and High Sheriff in 1864. He was also Captain in the Donegal Militia. He was born in 1835 and in 1878, he married Annie, daughter of Conolly Norman. Burke traces the Norman genealogy back to Samuel Norman, Esquire of Londonderry, Mayor of said city in the 1670s. He married Margaret, daughter of William Latham, and had daughters with her as well as a son, Charles Norman (born 1606, Member of Parliament for Londonderry). He later married Elizabeth, daughter of John Gage, Esq. of Magilligan in Derby, and had a son with her named Robert. This Robert Norman was Esquire of Dublin, Member of Parliament for Derry 1733, and Mayor from 1711-1715. He married Sarah, daughter of Reverend John Boloton of Lagore in Meath, and had the following children with her: Thomas (married Anne Ward), Frederick, Conolly, Florinda (married Charles Gardiner). His son Conolly was an Esquire of Dublin, Ireland and in 1762 he married Ane, daughter of Luke Gardiner, and he had issue with him: Charles (married his cousin, Florinda Norman), Thomas, Reverend Robert, Luke (married Anne Worthington). His son Thomas Norman, Esq., in 1799, married Catherine, daughter of Hugh Lyons and had the following children with her: Charles, Reverend Hugh, Thomas, Anne (married Robert Maxwell of Middle Gardiner Street), Catherine (married Thomas Kough), Florinda (married Livingstone Thompson). The eldest of these was Charles, who was Justice of the Peace for Donegal. In April 1829, he married Anna Eliza, daughter of Edward Kough, of New Ross, county Wexford, and had an only son with her named Thomas Norman, who was an Esquire of Glengollan. The discussion begins with the mention of the latest member. 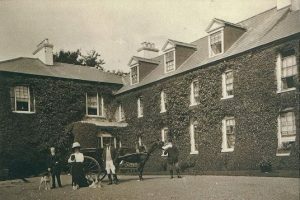 The Baron Norman of St. Clere in county Kent was born in 1871. He was educated at Eton and King’s College Cambridge. He was a Captain in the 4th Bn Bedfordshire Regiment and served in South Africa for about a year starting in 1900. He was also a Lieutenant for the city of London and a partner in the form of Brown Shipley and Co. He was created a Baron in the Peerage of the United Kingdom in 1944. In 1933, he married Priscilla Cecilia Maria Worsthorne, Justice of the Peace of London, daughter of Major Robert Reyntiens and Lady Alice Josephine. Burke traces the lineage back to James Norman, of Bromley Common in Kent who was born in 1713. He married Henrietta Wroughton in 1751 and had a son with her. This son was George Norman who was born in 1756 who, in 1792, married Charlotte, daughter of Reverend Edward Beadon, and had issue with her. One such issue was George Warde of Bromley Common who was born in 1793 and, in 1830, married Sibella, daughter of Henry Stone, and had issue with him as follows: 1) George Herman (Captain 57th Middlesex Regiment, fought in Crimea), 2) Charles Loyd of Bromley, Kent (who was Justice of the Peace and Deputy Lieutenant), 3) Herad (married Eleanora Norman), 4) Frederick Henry, 5) Richard James, 6) Philip, 7) Edward (married Eleanor Akers), 8) Sibella Charlotte (married Henry Bonham-Carter), and 9) Mary Henrietta (married Alfred Bonham-Carter). The fourth son, Frederick Henry Norman was Deputy Lieutenant and Justice of the Peace of Moor Place, Much Hadham in county Hertfordshire and was born in 1839. In 1870, he married Lina Susan Penelope, daughter of Sir Mark Wilks Wollet, 1st Baronet of St. Clere, and he had four children with her: 1) Montagu Collet (created a Baron in 1944), 2) Ronal Collet (married Lady Florence Sibell), 3) Richard Frederick (served in World War II as Captain of Coldstream Guards, married Maria Cristina Walford), and 4) Gertrude (married Frederick Robert Stephen Balfour of Dawyck, Stobo, Scotland). The Norman Coat of Arms (erroneously called Norman Family Crest) is blazoned as following in heraldry: Argent on a bend gules three stag’s heads cabossed of the field, a chief sable thereon three bezants. Crest: A stag’s head erased proper charged with a fesse or thereon a torteau. Supporters: On either side a hind holding in the mouth a sprig or, oak leaved and fractured proper. 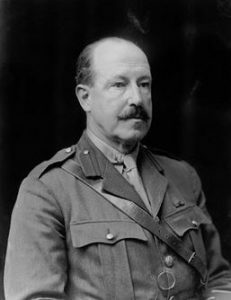 Sir Mark Annesley Norman, 3rd Baronet, of Honeyhanger, was educated at Winchester and served in the Coldstream Guards in Palestine. He was born in 1927 and succeeded his father in 1927. Burke traces the Norman genealogy or Norman ancestry for this lineage/pedigree back to Roger Norman who lived in Ashby Parva in county Leicester. He had three sons: William, Rogers, and Thomas. His son William was of Frolesworth and Oadby and he had issue as well. His son, Sabine Norman lived in the late 1500s and early 1600s, and had had seven sons and two daughters with his wife (named Meriall). One of his sons was James of Oadby, Churchwarden who married Anne and had three sons with her. Their eldest son was William who was born in 1663 and married Francis Smalley (his second wife) and had a son and daughter this her. The son’s name was Thomas Norman of Oadby who was born in 1673. In 1701, he married Alice Voss and had five sons with her. One of those sons was William, of Ayleston, was born in 1703. In 1722, he married Jane Spencer of Anstey, and had four sons and one daughter with her. One of those sons was William Norman of Newtown Linford who was born in 1762. He first married Sarah Johnson and had one son and two daughters with her. He secondly married Mar. Balding and had a son with her, named Henry. This Henry was of Linford House and was born in 1814. 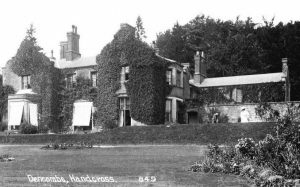 Henry was a member of the Leicester Town Council and in 1855, he married Sarah Edna, daughter of James Riddington, of Hazelbeach, and had issue with her: Henry and Maude (married Robert Duddingstone Herdman). The son becamse Right Honorable Sir Henry Norman, 1st Baronet, of Honeyhanger and a Knight, as well as Justice of the Peace in county Surrey. 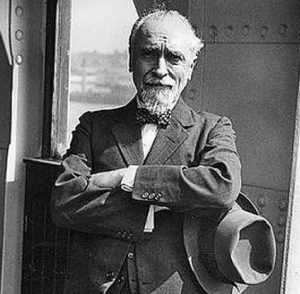 He was educated at Harvard University and the University of Leipzig. He held numerous positions and titles, which Burke lists, and in in 1891 he married Menie Muriel, daughter of Sir James Muir Dowle, and he had issue with her: Henry Nigel St. Valley (2nd Baronet), Antony Charles Wynyard, and Laura Rosaline. He died in 1939 and was succeeded by his son, Sir Henry Nigel St. Valery Norman, 2nd Baronet. Henry was educated at Winchester and Trinity College Cambridge and served in both World Wars. He was born in 1897, and in 1926, he married Patricia Moyra, daughter of Lieutenant-Colonel James Howard Adolphus Annesley, and had issue with her: Sir Mark Annesley Norman (mentioned at the beginning of this paragraph), Nigel Desmond (heir presumprove), and Torquil Patrick Alexander. He died while flying in service and was succeeded by his eldest son. The Baronet was created in June of 1915.The Norman Coat of Arms (erroneously called Norman Family Crest) is blazoned as following in heraldry: Sable a thunderbolt and in chief two crosses pate pierced with the eight symbols of Foh-he (or Pa-qua_ and charged with a roundel containing the Eastern symbol known as Tal-keih all or. Crest: Upon a mount vert a spear erect transfixing a saracen’s head all proper. Supporters: Two Norsemen proper. Richard married Margaret Alford and Florence (last name unknown), at different times, and had the following issue: John Sr., Elizabeth, Margaret (Fowler), Susannah (Ferris), Florence Alford, and Lieutenant Richard. His son Richard Norman, in addition to being a Lieutenant, was a fisherman and innkeeper who was born in 1623 in Southwick, Hampshire and went to America with his dad. He married Elizabeth Whitridge and Margaret Goodwin and he had three issue: Rebecca Diamond, William Sr., and John. His son William Norman Sr. was born around 1649 and married a woman named Rebecca with whom he had a son named Moses. Moses was born around 1673 and he married Rebecca Summer and had a son with her named John. This John Norman was born around 1710 in Collecton County, South Carolina. He married Elizabeth Bedon and had a son with her named Richard. This Richard was born in around 1744 and he married Esther Sarah Couturier and had had a son with her named James Mitchell Norman who was born in Liberty County, Georgia in 1792. He married Ruth Taylor Tillman and they had a son together named Joseph James Norman who was born in 1833 in the same state. Joseph James married Mary Elizabeth Strickland and they had a son together named Richard Cleveland Norman who was born in Georgia in 1883 and died in 1960. 1) Hugh Norman of Plymouth, who married, 1639, Mary White, and moved to Yarmouth and had a daughter named Elizabeth who drowned in 1648, then he moved to Barnstaple. 2) John Norman of Salem, 1631 who with his wife Arbella, had issue: John, Lydia, Ann or Hannah, Arabella, Martha, Richard, Joseph, and Joseph. 3) Richard Norman of Salem, likely brother of the above mentioned John, came from Dorchester, England in 1626, with his son, also named Richard. He may have also had a son named Richard. Joseph, age 19, came to Bermuda in June 1635 aboard the Truelove. George Norman, age 25, came to Bermuda in June 1635 aboard the Truelove. Joseph Norman, age 20, came to Virginia in July 1635 aboard the Primrose. Cornelius Evans Matthew Norman came to Bermuda in the 1660s. Other settlers in early colonial American bearing the surname include Peter Norman (Virginia 1634), Henry Norman (Virginia 1634), Austice Norman (Virginia 1634), Eliza Norman (Virginia 1701), Rachel Norman (Virginia around 1703), Joshua Norman (Boston 1712), and Caleb (Boston 1712). Some of the earliest settlers in Canada were a family who settled in Brigus, Newfoundland in 1714, from who James and William Norman descend. In New Zealand, the one of the earliest settlers with this last name was E. Norman who came in 1842 aboard the Brougham and landed in the city of Wellington. In Australia, one of the earliest settlers was a convict from Essex, England named Thomas Norman, who came in 1822 aboard the Asia and settled in New South Wales, which was then a penal colony. There are hundreds of notable people with the Norman surname. This page will mention a handful. Famous people with this last name include: 1) Albert Norman (1882-1964) who was one of the founders and first secretary of the Institute of Biomedical Science, 2) Fred Barthhold Norman (1882-1947) who was a member of the U.S. House of Representatives from Washington during the mid-20th century, 3) Gregory John Norman (1955) who is an Australian professional golfer from Mount Isa, Queensland who was ranked as the world’s best golfer for 331 weeks in the 1980s and 1990s, 4) John Norman who was the mayor of London in 1250 AD, 5) Jimmy Norman (1937-2011) who was an American rhythm and blues and jazz musician from Nashville, Tennessee known for his session work with Jimi Hendrix and for co-writing the Rolling Stone’s Hit Time Is on My Side, 6) Larry David Norman (1947-2008) who was an American musician, singer, and record producer considered to be one of the pioneers of Christian rock, 7) Robert Norman who was an English Marine living in the 1500s who built compasses and discovered magnetic inclination, and 8) Rex Norman (1891-1961) who was an Australian from Sydney who played rugby and cricket and represented New South Wales for both sports. The two most prominent symbols in the Norman Coat of Arms (erroneously called the Norman Family Crest) are the fleur-de-lis, leopard’s face, and escallop.